The Luxembourg Income Study’s Gini Coefficient is a better measure of inequality than the World Bank’s Gini coefficient (Gini coefficient is a measure of the income inequality, with higher numbers indicating a higher concentration of a country’s income among the top earners). Rank correlation coefficients are a better measure of mobility than intergenerational elasticity. Recently released data indicates that the mobility trend has been relatively flat over time in the United States. I’ll address each of these points below. But let’s first begin with the line to serfdom itself. Figure 1 has the full data set from University of Ottawa economist Miles Corak’s paper, which includes 22 countries instead of the 11 countries included in the Winship and Schneider analysis (it is unclear why they decided to cut half of the countries from their comparison). I used mobility data from Figure 1 of Corak’s paper and Gini data from the World Bank to create Figure 1. This graph indicates an inverse relationship between inequality in a country and economic mobility between generations. The line is known as the “Great Gatsby Curve” (or, if my arguably more apt name takes off, the line to serfdom). With this in mind, let’s turn to the three points Winship and Schneider make about the Gatsby Curve (or line to serfdom). 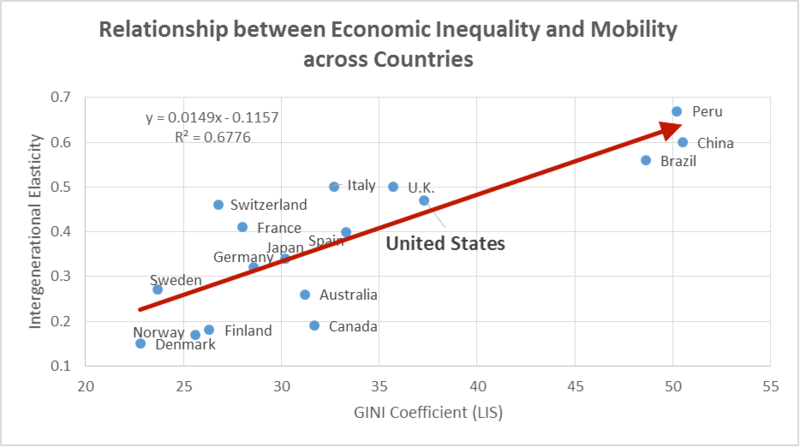 Winship and Schneider contend that the analysis should have been done using the Luxembourg Income Study’s Gini coefficient because it “has taken great care to make each country’s measure as comparable as possible.” I do not have strong feelings as to which is the appropriate Gini coefficient to use in this situation, but for consideration I have reproduced the inequality/mobility relationship using LIS data in Figure 2 below. Five of the 22 countries included by Corak were not in the LIS data set (Argentina, Chile, New Zealand, Pakistan, and Singapore), so this chart includes only 17 countries. Winship and Schneider used only 11 countries and found a slightly flatter line than the original. In contrast, when we include the data omitted from their work, we find an even steeper line. Therefore, when using Winship and Schneider’s preferred measure of inequality, higher levels of inequality indicate much lower levels of mobility than using the World Bank’s numbers. Furthermore, in addition to having a higher slope than the line visible using Corak’s initial measure of inequality, using the LIS data also results in a line with a higher R^2 value. So when more data are included, the relationship between inequality and mobility is strengthened, not weakened using their preferred inequality measure. The second point made by Winship and Schneider is more nuanced. They note that when using rank correlation (how much a child’s income rank is related to the parents’ income rank) to measure mobility instead of the intergenerational elasticity (how much a child’s income is related to the parents’ income), the international relationship between inequality and mobility is murkier. 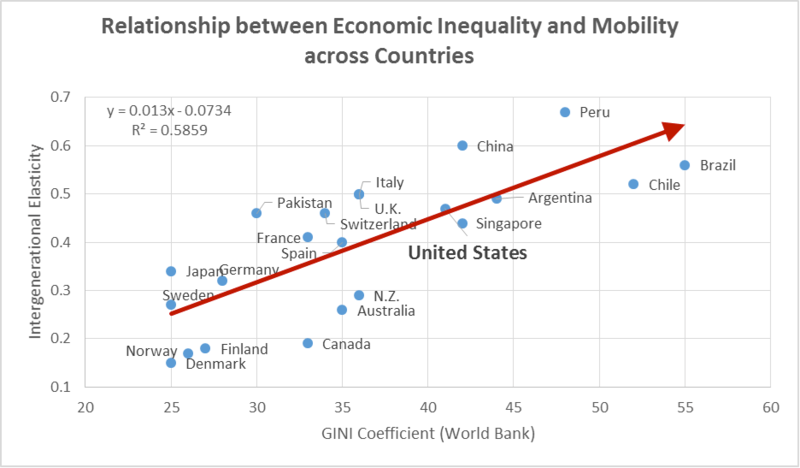 Specifically, they focus on a positive relationship between mobility and inequality when comparing three countries: Canada, Sweden and the United States. The fact that this conclusion relies on only three data points indicates that it does not result in a reliable regression. In other words, the data are simply not sufficient to draw meaningful conclusions across countries. I will note that Winship and Schneider readily admit there are not sufficient data across countries to do a rigorous analysis using the rank correlation. Yet the data released by the Equality of Opportunity Project cover the majority of the United States and indicate that both the size and shape of the middle class matters. In an earlier blog post, I responded to Winship and Schneider’s first attack on the Gatsby curve using these data. The bottom line is that the rank correlation measure of inequality is correlated with inequality measures related to the size of the middle class in the United States. Even if there were sufficient data to draw the conclusion they propose, should we prefer the rank correlation measure? On the one hand, we should care about both measures, as both are useful for a providing a textured understanding of problems related to low mobility and high inequality. On the other hand, if we are going to prefer one measure over another then I would suggest that the intergenerational elasticity is more important because it captures the consequences of mobility. The income gap between children of high-income individuals versus children of low-income individuals describes the income penalty from the birth lottery. Winship and Schneider also charge that inequality has risen but mobility has not fallen, suggesting inequality and immobility are not related. They correctly note that a recently released working paper from the Equality of Opportunity team finds that the rank correlation measure of economic mobility has been stable of time. Sadly the new data do not include information on my preferred mobility measure, the intergenerational elasticity. If someone knows of a good data source for intergenerational elasticity over time for the United States please let me know. I would love to see if that replicates our line to serfdom. I have two posts looking at this recently released data on the change in economic mobility in the United States over time. My first post provides the most apt response to their assertions. For those that haven’t read it, the bottom line is that while the data indicate that mobility has been generally flat for birth cohorts from 1971 to 1993 despite rising inequality, in the same time frame the U.S. economy nearly doubled, racial desegregation efforts went into effect, and opportunities for women grew substantially. Despite all the social progress and economic gains, economic mobility did not rise. Perhaps absent these changes, mobility would have fallen, though rigorous analysis would be needed to verify such assertions. My second post on these data includes maps of the changes in economic mobility over time. While this may sound like the standard “OMG-someone-is-wrong-on-the-Internet” response, in this case being wrong carries important consequences. The Winship-Schneider piece is part of a narrative that economic mobility and inequality are unrelated and therefore policymakers’ attention to economic inequality is misplaced. These claims are not supported by the data or by published economic literature. There is much more analysis to do before one can make claims delinking economic inequality and mobility—just as there is plenty of analysis to consider when examining whether there are links between income inequality and economic growth.